Documentation: recordings: Stearns (2018), Leger (2018); photograph: Carlini (2018); 15 May 2018 Wilderness Park, Lancaster Co.
Record: The single accepted record is of one at Wilderness Park, Lancaster Co 15 May 2018 (cited above). This bird was located early in the day by its loud song by Ruth Stearns, who photographed and recorded the bird. It was subsequently seen, photographed, and recorded by many on 15 May (eBird.org, accessed Jun 2018) but it was not relocated the next day. Including this record, there are five published reports, the other four in the period 11-27 May. Three reports are accompanied by descriptions that are suggestive of this species, none conclusive. One was seen by C.A. Mitchell near Camp Gifford, possibly within present-day Fontenelle Forest, 27 May 1927 in a marshy strip along the Missouri River in small willows partly inundated by floodwaters; good details were provided (Swenk 1927). Another was seen in the Aurora City Park, Hamilton Co by Mrs Kermit Swanson 16 May 1956, in a small bush (Swanson 1957). A fourth report is of one seen and heard singing for about an hour in Wilderness Park, Lincoln on 15 May 1977 by a Mr Toews. It was heard singing again about two hours later (Cortelyou 1977). The fifth report, without details and listed as a “Questionable Record”, was of one at Stuart, Holt Co 11 May 1952 (Rapp 1952). Comments: There is a specimen, HMM 2834, purportedly taken at Kearney, Buffalo Co 9 Apr 1905 by C.A. Black at Kearney and mounted by him (Worthen 1906). The bird was in his yard, “hopping around on the ground under some cedar and maple trees”; the specimen was disposed of to Charles K. Worthen but relocated by Brooking after Worthen’s death about 1920. That it was the same specimen collected by Black was confirmed by Black based on the mounting used. It is now on display in the Hastings Municipal Museum (Brooking 1933, Bray et al 1986). We have some concern about the provenance of this specimen, particularly because of its very early date of occurrence, and also because of the presence in the Brooking collection of other unique specimens. All records for Kansas and Colorado are in the period 4 May-27 Jun, although the earliest arrivals at an Arkansas breeding site are “regularly 8-9 Apr” and peak arrival of males there is 13-24 Apr (Anich et al 2010). 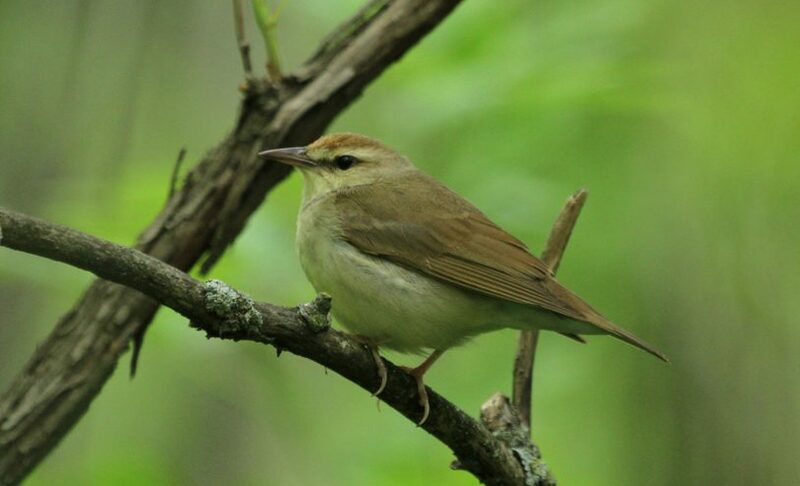 Swainson’s Warbler does not overshoot its breeding range as often as other southern warblers, and when it does so it is usually in late Apr-May (Dunn and Garrett 1997). The nearest breeding populations are in southern Missouri, northwestern Arkansas, and eastern Oklahoma (Anich et al 2010). There are no accepted records for Iowa or South Dakota. There are nine records for Kansas, two of which are in the western half of the state; other than two Jun records, seven of the nine are in the period 4-23 May (Thompson et al 2011). There are 10 records for Colorado, eight of which are in the period 12-31 May, and two in fall, 16-23 Jul and 7 Sep (CBRC 2018); Andrews and Righter (1992) cited a record 8 Jun that is not listed by CBRC. The Colorado records are all east of the Rocky Mountains, mostly from southeast Colorado, with a few north to Adams Co (CBRC 2018). Photograph (top) of a Swainson’s Warbler at Wilderness Park, Lincoln, Lancaster Co 15 May 2018 by John Carlini. Anich, N.M., T.J. Benson, J.D. Brown, C. Roa, J.C. Bednarz, R.E. Brown, and J.G. Dickson. 2010. Swainson’s Warbler (Limnothlypis swainsonii), version 2.0. In The Birds of North America (A. F. Poole, Editor). Cornell Lab of Ornithology, Ithaca, New York, USA. https://doi.org/10.2173/bna.126. Brooking, A.M. 1933. The loss and recovery of the first Nebraska specimen of the Swainson’s Warbler. NBR 1: 132. Carlini, J. 2018. Checklist S45756677: Wilderness Park–Old Cheney Road, Lancaster County, Nebraska, US. eBird.org, accessed 23 Jun 2018. Colorado Bird Records Committee [CBRC]. 2018. Swainson’s Warbler records. Colorado Bird Records Committee database, accessed 22 Jun 2018. Leger, D. 2018. Checklist S45704929: Wilderness Park–Old Cheney Road, Lancaster County, Nebraska, US. eBird.org, accessed 23 Jun 2018. Stearns, R. 2018. Checklist S45702356: Wilderness Park–Old Cheney Road, Lancaster County, Nebraska, US. eBird.org, accessed 23 Jun 2018. Swanson, K.S. 1957. Hamilton County. NBR 25: 27. Swenk, M.H. 1927. Letters of Information 23: 6. Worthen, C.K. 1906. Swainson’s Warbler in Nebraska. Auk: 23: 227.